More Bees in More Places!!! 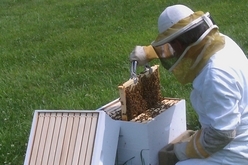 WE DO NOT TREAT OUR HIVES WITH CHEMICALS! with our treatments. 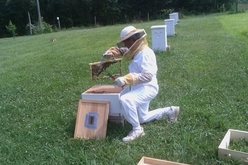 "- Michael Bush, Bush Bees. Check out all of our videos now on YouTube! 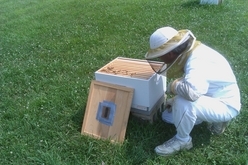 Below is a slide show of our apiary and one of our hive inspections from a few years back. 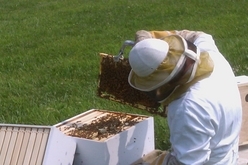 There is also a picture of the swarm that landed on one of our empty hives May 5th, 2011. 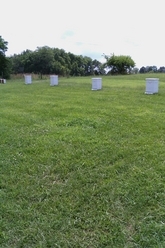 We had inspected our other hives the day before and there were no swarm cells in any of them. 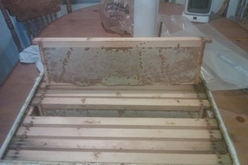 This swarm covered 15 of the 20 frames in the 2 hive bodies and 4 of them were empty frames with no comb or foundation. 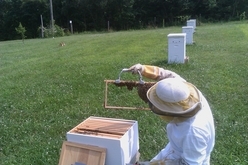 ( We only use foundation in the honey supers of our hives. - Michael Bush, Bush Bees. 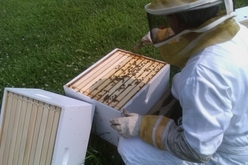 A team of recent high school graduates with the help of the people at Häagen-Dazs, concerned about the serious situation facing honey bees, created their own interpretation of the instinctual honey bee waggle dance. Grab a friend, learn the dance, and "Do the Honey Bee!" 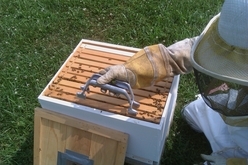 A live hive we removed from the eve or "Flying-Rafter" area of a house.